Fossil records lead to the conclusion that sea turtles are contemporaries of the dinosaurs. Although dinosaurs disappeared, turtles continue to survive to the present date. Their body is protected in a horny shell. One exception is the leatherback sea turtle (Dermochelys coriacea) with its leathery skin shell covering. The shell. The shell is the most noticeable feature of all turtles. Comprised of a number of bones, it is an armoured enclosure for soft vital organs. It consists of mainly two parts: the upper shell or carapace and the underside, or plastron. Tortoises and terrapins often have dome-shaped carapaces which allow them to withdraw their head and limbs in their shell in case of danger. Sea turtles do not have this capability. The evolutionary process has led them into having more hydrodynamically shaped carapaces. Propulsion. Over time the stumpy legs of land turtles evolved into the flattened flippers of sea turtles. The front flippers are used for propulsion while the rear flippers act as rudders. Respiration. Sea turtles breathe with lungs. This forces them to regularly surface in order to take in air. As mentioned earlier, sea turtles are able to sustain larger concentrations of carbon dioxide in their blood than most other air-breathing animals. Furthermore, both blood and muscle tissue can store oxygen in large quantities. This allows them to spend a lot of time under water. Sea turtles have been observed spending up to six hours under water, sleeping. Essentially, sea turtles live in the marine environment where they mate, feed, migrate and hibernate. Females return to land to dig nests and lay eggs. Males will almost never return to land. Little is known about the sea turtle's juvenile years. After the eggs hatch, the hatchlings crawl to the sea. For the first few days they swim frantically towards the sea. Once in the open sea, they let themselves drift with the currents. Little is known about what happens next until it is time for them to return to their breeding habitats to nest. It is believed that during their pelagic stage they feed first on plankton and then snails, turnicates, gooseneck barnacles and other organisms of the high seas. After this pelagic state, sea turtles tend to live in coastal waters, except the olive ridley (Lepidochelys olivacea) and the leatherback that remain pelagic animals for their entire lives. Sea turtles do not have the speed and agility to catch fast-moving prey. Therefore, most feed on slow moving or sedentary animals like jellyfish, molluscs, sea urchins, horseshoe crabs, sponges, and on sea grasses. Turtles have been found to have a well-developed sense of smell that may help them to locate food. When the time comes for reproduction, adult sea turtles migrate toward their nesting areas. Mating has been observed during these migrations, as well as in the offshore waters adjacent to the nesting beaches. Soon after mating, the females approach the nesting beaches where they emerge to dig nests and lay their eggs. Most species nest at night, with the exception of the ridleys that also nest during the day. 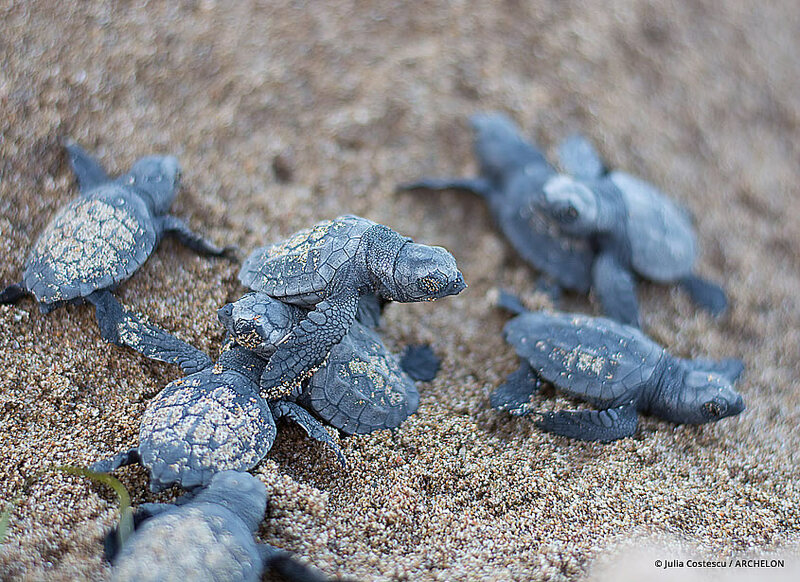 The most spectacular nesting is the "arribada" (Spanish for "arrival") of the ridleys, when thousands of turtles come out to nest simultaneously over a few days. Mating: Adult males have longer, thicker tails with the cloacal vent further back than in females. During mating the male mounts the female holding on to her carapace with its fore limbs. His longer tail is bent downwards, pressing his cloacal opening against the female's cloaca. There is evidence that females can store sperm for long periods of time for future fertilisation of eggs. Nest Construction: Leaving the water, the female sea turtle crawls up the beach to find a suitable nesting spot. Females of most species will return to the sea without laying eggs if lights or noise on the beach disturbs them. Once the female has found a nesting site, she hollows out a body- pit sweeping away the dry top sand with her flippers. Then using alternate movements of her rear flippers she digs a pitcher-shaped hole, the egg chamber. When the female has finished digging, she drops her eggs into the egg chamber one or two at a time. While laying her eyes excrete "tears" which is a liquid from a special gland in the eyes. This liquid carries off excess salt, and also serves to keep her eyes moist and free from sand. Immediately after the female is finished laying her eggs, she starts covering the egg chamber. When this is complete the turtle starts to press firmly the loose sand above the eggs with "kneading" movements of her rear flippers. She then conceals the nest site with sweeping movements of the front flippers, throwing a considerable amount of sand. The female then leaves the site and returns to the sea. The eggs: The eggshells are pliable, parchment-like in texture. The number of eggs a female lays varies from species to species (about 50 eggs for flatbacks Natator depressus and 80 to 120 for the other species). There are even variations within a species. During one nesting season a female lays several clutches. Generally, sea turtles nest every two to four years. Hatching: The eggs hatch in seven to ten weeks, depending on the temperature of the sand. 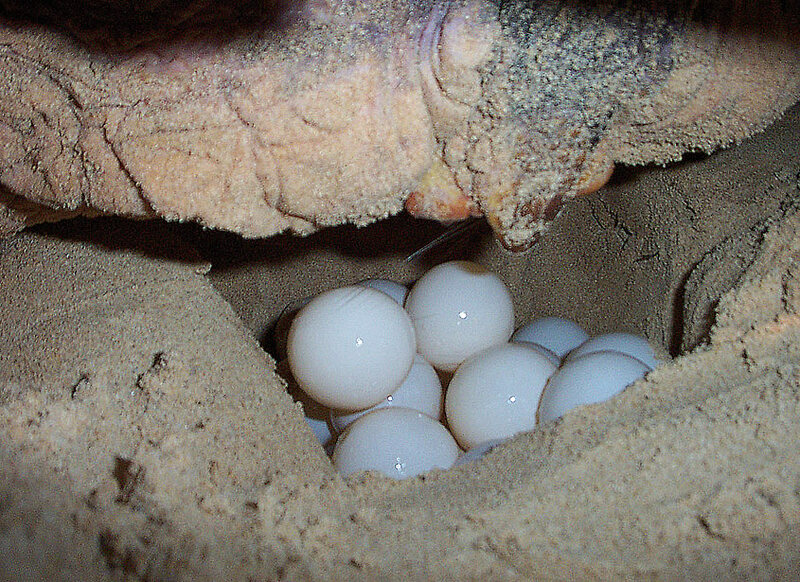 As hatchlings break out of the eggs they struggle towards the surface. Because oxygen is scarce, this upward movement may take from 2-4 days. As they reach the upper levels of sand during the day, they stop any further movements as high temperatures make them torpid. They wait just below the surface until the sand has cooled at night or in the early morning, then they emerge en masse and race toward the sea. The reflected starlight guides them to the water. With such large number of eggs, nests usually hatch in batches. For instance, in Greece, a successful nest of 110 eggs will quite likely produce 35 to 50 hatchlings when it first "breaks", then for another 2 to 10 days produce two to three smaller batches of 5 to 20 hatchlings. Some of the eggs are probably unfertilised or contain unhatched embryos. The World Conservation Union (IUCN) has declared 6 species of sea turtles as endangered or critically endangered. The threats for sea turtles are both natural and man-induced. Natural Threats: There are of course natural threats to the survival of sea turtles, their hatchlings and eggs. Weather is a prime factor. Wind, rain and cold and unnaturally high tides, all take their toll on turtles at all stages of their lives. Temperatures below 14°C stun even adult turtles. Beach erosion destroys nesting beaches. The natural enemies of eggs and hatchlings vary depending on geographical location. In Greece, foxes, dogs and occasionally jackals may dig up the eggs. Hatchlings racing for the sea are sometimes eaten by those animals as well as by martens and rats, or by birds like crows, gulls and cormorants. Once the hatchlings have reached the sea they may be devoured by large fish such as sharks. By-catch in fishing gear resulting in drowning or being killed by fishermen. Nesting beaches are dramatically shrinking because of development, especially tourist development. f) Sand castles and vehicle tracks may trap hatchlings in their race to the sea. Pollution of the seas is yet a further threat. Turtles often mistake discarded plastic bags for jellyfish, tar balls or a chunk of polyethylene for something to eat. If they consume these foreign substances their intestines may become clogged and they may die. Out of the seven species in the world, only three can be regularly found in the Mediterranean (loggerheads - Caretta caretta, green turtles - Chelonia mydas and leatherbacks - Dermochelys coriacea). Of these three only the loggerhead sea turtle nests in Greece. The most important nesting beaches are in Zakynthos (Bay of Laganas), Peloponnesus (Bays of Kyparissia, Lakonikos and Koroni) and on Crete (Rethymno, Bay of Chania and Bay of Messara). The beaches of Zakynthos have an extremely high nesting density. The density on one beach (Sekania) may reach about 1500 nests per km, one of the highest in the world. The loggerheads' carapace is heart-shaped and has five pairs of costal scutes. The colour of the carapace is reddish brown but can be obscured by a covering of green algae. The plastron is pale yellow. Loggerheads tagged in Greece have been recovered over a wide area, up to 1500 km away, in Italian, Tunisian, Libyan waters suggesting purposeful non-random movement. 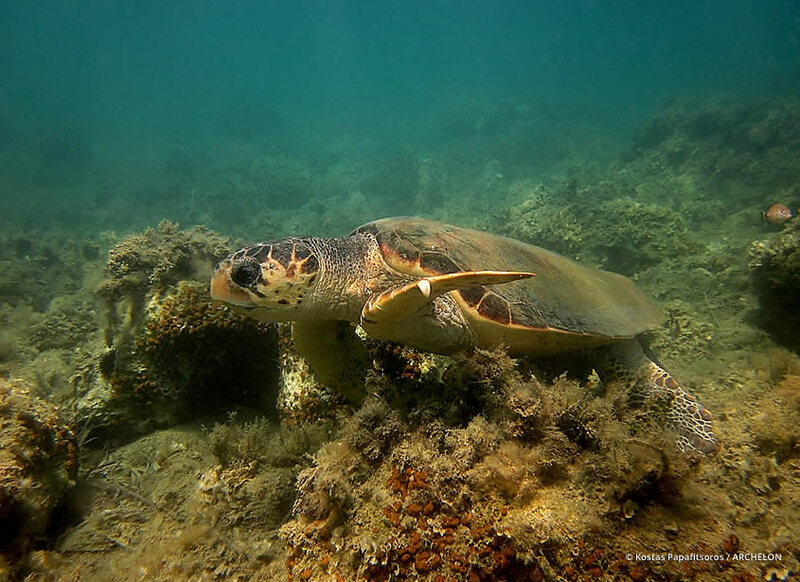 Most of the recoveries are from the Gulf of Gabes in Tunisia and the northern part of the Adriatic Sea which probably indicate that these are the preferred wintering areas for loggerhead turtles. 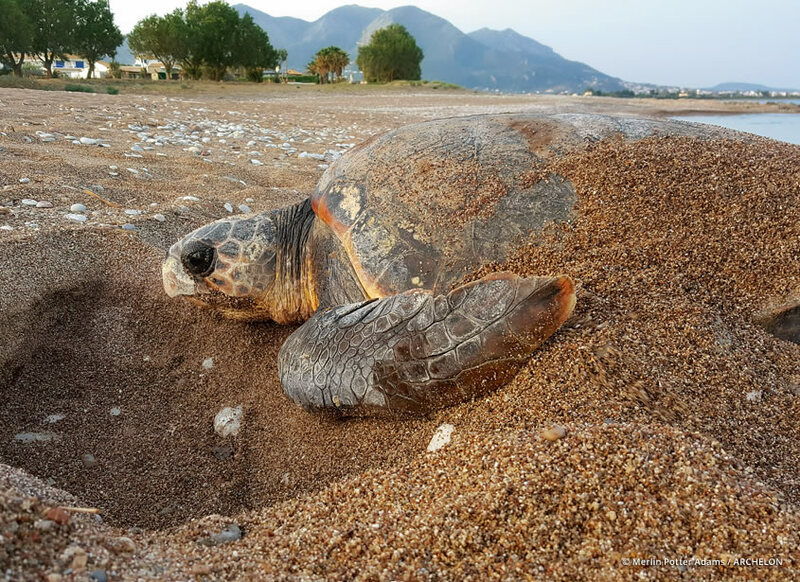 The most serious threats to loggerheads in the Mediterranean are tourist development of nesting beaches and incidental catch in fishing gear.